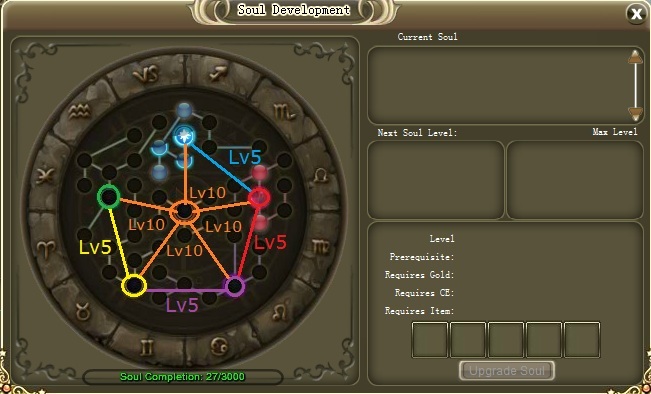 Hello to all Vidalian, This is a picture guide on how to effieciently use ur soul system. 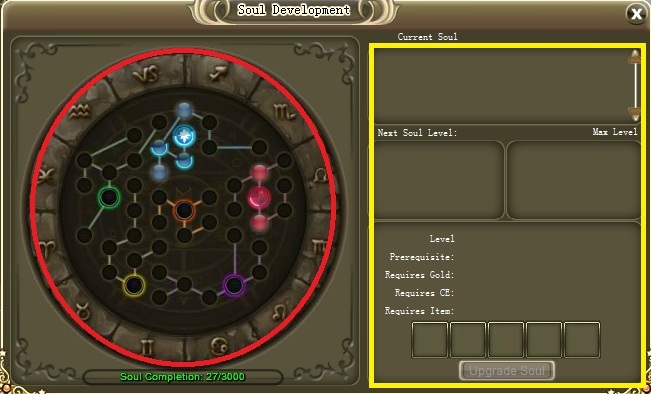 U will need to be at least level 30 to able to use soul system. The first method are always the fastest way to open ur soul window. At this segment, it shows that how many spirit braches have already opened, u can also the progress by looking at the color of the round branches. I will get shinier when u reach higher tier of it. As it say, it is u progress bar, which is how many u have opened/upgrade. U can find everything about ur soul here, Current Soul, Current Soul level, Max level, and everything required for the upgrade is there too. As the picture shows, my Spirit of Ice is already Level 5. Take note that for every skill upgrade u need to upgrade ur Spirit too. For example, If u want to upgrade Toughness branch to lvl 5, ur soul spirit also need to be lvl 5 or u cant upgrade it. So this means that for every upgrade we have to met the requirement needed for it. To upgrade my preciousness to lvl 5 i need to get my toughness to lvl 5 and to upgrade my toughness to lvl 5 i need to upgrade my spirit to lvl 5. Its kinda a chain where every single pieces is connected. Spirit of Ice lvl 1 is required to open the first branch in Spirit of Ice Tree. 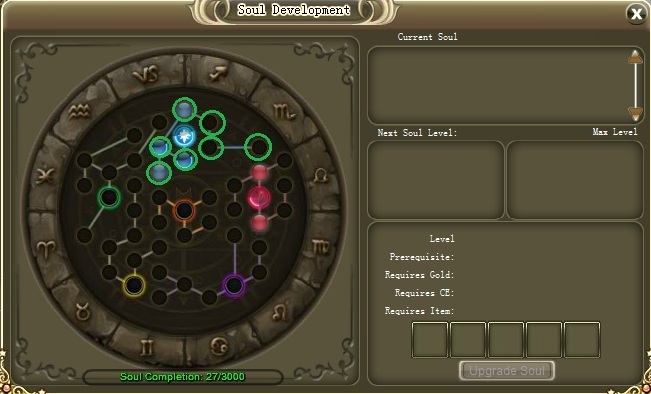 There are 7 branch that can be opened in each Soul Spirit Tree and for the last soul spirit, 5 branch. To open the next branch that are not opened yet, u need to get the branch before it to at least lvl 1. To open next Spirit Tree, u need to get previous tree to at least level 5. Spirit of Ice Lv5 –> Spirit of Briliance Opened –> Spirit of Briliance Lv5 –> Next Spirit Tree opened and so on. Spirit of Ice : Pdef, Mdef, Increased Def %, Damage Reduction, Endurance, AP and Crit Def.. Spirit of Void : increase hp, dodge, armor penetration and crit defence. Spirit of Heart : Increase Hp, Hp % increase, Patk/Matk Reduction, Luck Increase. For Spirit Skill level and Upgrades Check out Toshihito guide. This Section is for material needed to upgrade soul. Can be obtained from any dungeon, or buy from other player. This item needed to upgrade all soul tree. Can be obtained via Item Shop for 165 crystal each, or through exchanging Soul Root Crystal at Ranger Elder, Tree of life. And also can be obtained through doing Ladder, u will get at every 10 Lvl cleared. Can be obtained through Revenant’s Vault Dungeon. Random drop from 3rd Boss, Vega. 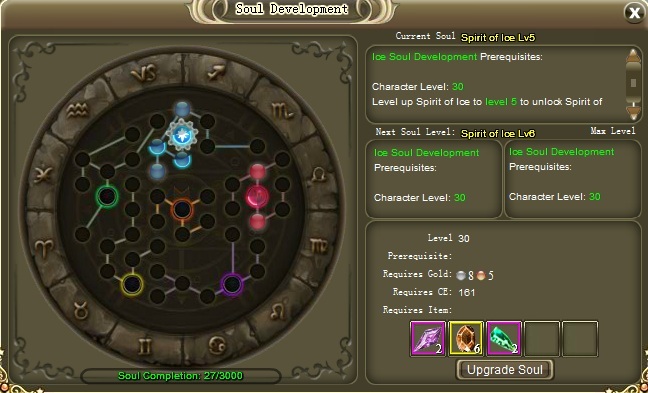 This item is needed to upgrade Spirit of Ice soul. Can be obtained through Blood Coliseum Dungeon. Random drop last boss, Vicelot. This item is needed to upgrade Spirit of Briliance soul. Can be obtained through Sacrificial Relic Dungeon. Random drop from last boss, Zabuga. This item needed to upgrade Spirit of Void soul. Can be obtained through Killer’s Den Dungeon. Random drop from last boss, The Councellor. This item needed to upgrade Spirit of Light soul. Can be obtained from Psychodelica Dungeon. Random drop from last boss, Princess Hitomi. This item needed to upgrade Spirit of Heart soul.